You can fund a field trip or pay for a graduate course. In fact, use it for any number of items or activities that will help your students learn more effectively (see below). Up to $500 for tuition, books, travel expenses, conferences, workshops, registration fees, other expenditures. For more information or to apply on the AAE website, click here. Up to $500 for books, software, calculators, lab materials, math manipulatives, art supplies, audio-visual equipment, other materials. At PACCE our goal is to support educators so that they can focus on students. Applications are due on October 1st. Apply on the AAE website online today. Remember to share this program with your colleagues and friends by clicking the ShareThis button on the top right of this blog post or by printing and distributing the program flyer (right). 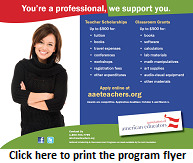 The National Teacher Scholarship and Classroom Grant Program is supported by the AAE Foundation. Find our more here. Author of this blog is discussing the new innovation which is great and exceptionally esay in use.Everyone have their framework which is extremely useful and they additionally assignment writing help of these frameworks in their work. I want to utilize innovation and wating to purchase new technolog. Oh my friend at essay help websites wanted to apply for this scholarship but we didn't know the date.Glad i saw this. I will tell her to apply right now. Its really great pleasure to know about scholarship because it helps the poor to get educated in affordable fee. Thanks for providing useful info i am much thankful to you for such an impressive article. I was also looking for some scholarships on the internet, and this post is very informative for me which is about teacher scholarship & classroom grants. This scholarship is really helpful for many of needed people around the world. I will must apply for this scholarship soon.